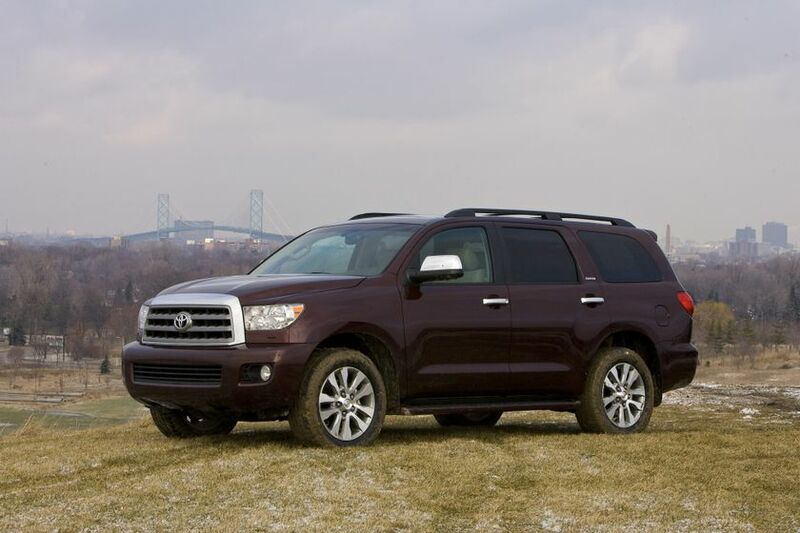 (TORONTO) – Canadians who require the power and performance of a full-size SUV to carry people and haul gear can now enjoy more power and fuel-efficiency with the new 4.6L engine of the 2010 Toyota Sequoia. Moreover, with the addition of standard safety equipment and audio features such as front knee airbags and integrated XM Satellite Radio the Sequoia is a safe, powerful, efficient and comfortable ride for the long road ahead. New standard equipment on all models, including: driver and front passenger knee airbags; Integrated XM Satellite Radio and USB audio input; redesigned glove box with LED lamp. A choice of three models: the Sequoia SR5 4.6L; the Sequoia Limited 5.7L; and the Sequoia Platinum 5.7L. The Sequoia SR5 4.6L, featuring a 4.6L i-FORCE V8 and six-speed automatic with TOW/HAUL mode. This combination delivers more peak horsepower (310 vs. 276), more peak torque (327 lb-ft vs. 313 lb-ft) and improved fuel efficiency (combined city/highway of 13.8 L / 100 km vs. 14.4 L / 100 KM) than the 4.7L engine/five-speed automatic transmission fitted to similar 2009 models. The new 4.6L engine’s performance can be directly attributed to two technologies that are new to the Toyota Sequoia. The 4.6-litre V8 features a Cooled Exhaust Gas Recirculation (EGR) System which reduces smog-forming emissions and improves overall fuel efficiency. Additionally, this new engine adopts an Acoustic Control Induction System (ACIS) to optimize power and torque output. The return of the powerful and capable 5.7L i-FORCE V8 in the Toyota Sequoia Limited 5.7L and the Toyota Sequoia Platinum 5.7L models. This proven engine delivers up to 381 horsepower and up to 401 lb-ft of torque, plus a towing capacity of up to 9,100 lbs / 4,125 KG, with a combined city/highway fuel efficiency of 14.0 L / 100 KM. Sequoia Limited 5.7L adds the following standard equipment: auto-dimming rear view mirror with integrated backup camera and compass; power tilt and telescopic steering wheel; Reverse auto-tilting exterior rear view mirrors; power-folding auto-dimming side mirrors with puddle lamps; driver’s seat memory system with linked exterior rear-view mirrors; and more. Sequoia Platinum 5.7L adds the following standard equipment: XM Real-time Traffic capability; woodgrain and leather-wrapped steering wheel and shift knob; interior woodgrain trim; and more. A new available Technology Package for the Toyota Sequoia Limited 5.7L, featuring: a voice-activated DVD-based navigation system with back-up camera; rear-seat DVD entertainment system with 9” monitor; XM Satellite Real Time Traffic capability; and more. The 2010 Toyota Sequoia full-size SUV is now on sale across Canada, with a manufacturer’s suggested retail price starting at $48,820.